EMP measures in the existing literature are oriented towards applications in crisis dating and prediction. We propose a modified EMP measure where cross-country comparisons are possible. 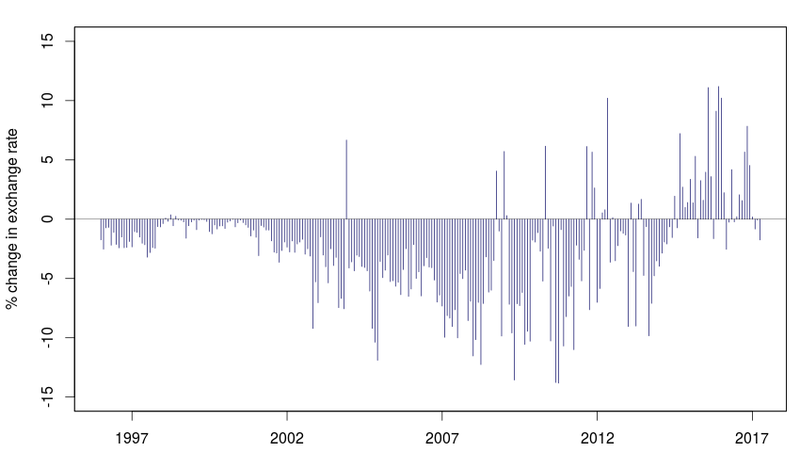 This is the sum of the observed change in the exchange rate with an estimated counterfactual of the magnitude of the change in the exchange rate associated with the observed currency intervention. We construct a multi-country dataset for EMP in each month. This opens up many new research possibilities. Improved measurement of Exchange Market Pressure (EMP) by Ila Patnaik, Joshua Felman, Ajay Shah, on Ajay Shah's blog, 27thMay 2017.